Produced for the finalists of the 2018 Lids Ultimate Hat Collection, this particular cap resides in a special place in my collection. While I gave it my best shot at seizing the title of Ultimate Hat Collector, I learned in defeat that I have so many friends and supporters across the Internet and locally. Whether it be through Twitter, Instagram or Facebook, I was incredibly humbled and appreciative of the retweets, the kind messages, and all the support from friends the world over. I would be remiss not to offer my biggest thanks once again to everyone for their help in my campaign. Thank you! My hat is truly off to you for your help and support. While I may not carry the title I know my place in the hat collecting community and will continue to do my best to be a steward for the hobby and an open source of knowledge to all who seek it. The finalist cap is a simple black cap with the logo and wording added post production; that is, the front was embroidered on a blank black cap. With the advent of Lids allowing New Era blank caps to be embroidered in-store and the drop of digitizing prices, the possibilities for collectors to create their own custom hats (with regards to copyright) has grown exponentially. Here’s a better look at the front embroidery. The Lids logo is raised embroidery and the hashtag script is flat and in gray/silver. A very clean look overall! At the rear of the cap is a edition number. The finalists of the prior year and this year each received their own numbered finalist hat. I don’t believe the numbers indicate rank in standings; even still, I’m very happy owning #8 of 8. I was born on an 8th in ’88, so 8 is a very good number for me. The underbrim and sweatband are black. You can see the post-production embroidery through the buckram of the cap. This cap of course was only awarded to the finalists of the 2017 and 2018 Ultimate Hat Collection contest and as such is an extremely limited edition cap. The only way for you to obtain one is to enter the contest next year and show off your collection! My thanks to everyone once again! 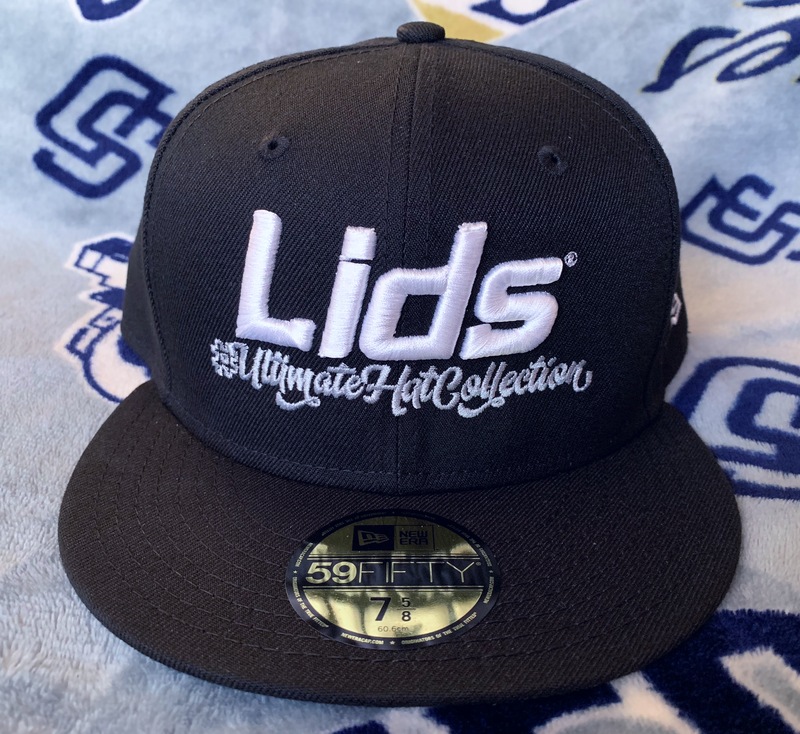 Big thanks also go out to my San Diego Padres for their support and help during my campaign and to Lids for holding the contest and picking me among the numerous entries!